The Trump administration will be forever remembered, among other things, as one that persecuted already disadvantaged people, and one whose corruption directly served the President’s own financial interests. The Muslim travel ban, the attempted transgender military ban, the attempts at Obamacare repeal, and the child separation policies at the border are just some of the initiatives that mark the administration as concertedly cruel. Meanwhile, the President’s failures to divest from his own company, and his recurrent use of his own properties, continually introduce conflicts of interest. And they often lead taxpayer money directly into his pocket. To the President’s many critics, none of this has come as a surprise. As critical analysts of the spaces around us, we should scrutinize the President’s flagship piece of real estate, Trump Tower, since we can see a reflection of the cruelty and self-dealing of the Trump administration built right into its faux-gilded walls. Instances of self-dealing can be found in the management of Trump Tower’s public spaces. And the populations subjected to cruelty through the building’s policies and designs include the homeless and disabled military veterans. 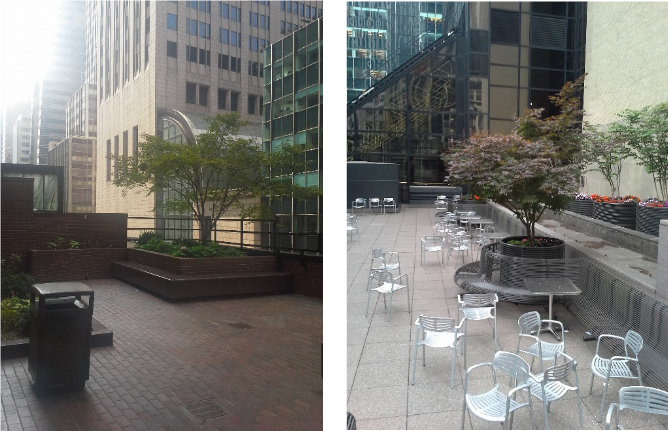 To draw out the problems with the public areas of Trump Tower, we need to consider two contemporary urban phenomena: “privately-owned public spaces” and “hostile design”. Sitting on Fifth Avenue in Manhattan, Trump Tower has served many functions for the President. Its gaudy interior has been the setting of his reality television show, the home base of his real estate empire, his campaign headquarters, as well as the site of the infamous “Trump Tower meeting” in which senior Trump campaign officials met with people with alleged ties to the Russian government offering dirt on their candidate’s opponent. One fact about Trump Tower that can get lost within all this commotion is that the building contains several spaces that by law must remain open to the public, all day (8am to 10pm), seven days a week. It is within the management of these public spaces – perhaps the only public good maintained by Donald Trump separate from his work as President – that we can hear an echo of the Trump administration’s callousness and corruption. In the late 1970s during the building’s development, Trump entered into a legal arrangement with New York City in which Trump Tower would provide and maintain a number of public spaces in exchange for special zoning bonuses. These kinds of agreements are called “privately-owned public spaces”, or POPS, and more than 300 such deals are currently in operation in NYC (e.g. Kayden et al. 2000; Miller 2007; Németh 2009; Schindler 2018). These typically take the form of things like plazas, breezeways, courtyards, atria, sun gardens, and seating areas. Every POPS agreement is different. Trump Tower’s particular POPS include its iconic gold-colored atrium with the multi-story waterfall, a hallway to the next building, and two upper-floor outdoor spaces. In exchange for having made these spaces public, Trump received permission to add twenty stories to the building. One problem with POPS is that they are all too often abused by their owners. As Jerold Kayden, an authority on these spaces, has explained, such abuses tend to come in three types: “denial of public access, annexation for private use, and diminution of required amenities” (Kayden et al. 2000: 56). That is, sometimes POPS are illegally closed off. They are sometimes exploited for personal uses, including private sector business purposes. And they are sometimes maintained poorly, or they no longer include legally required amenities. As legal scholar Sarah Schindler explains, POPS “invite a conflict of interest; the private building owner would prefer not to have members of the public disturbing its residents and tenants. The presence of members of the public – and especially certain ‘undesirable’ members of the public – causes problems that might not exist if the space were truly private” (2018: 1138). On the one hand, the violations committed by Trump Tower, reviewed below, are unfortunately not out of the ordinary for POPS in New York City. A recent report by the NYC Comptroller found more than half, including Trump Tower, to have current compliance issues (Ford 2017). 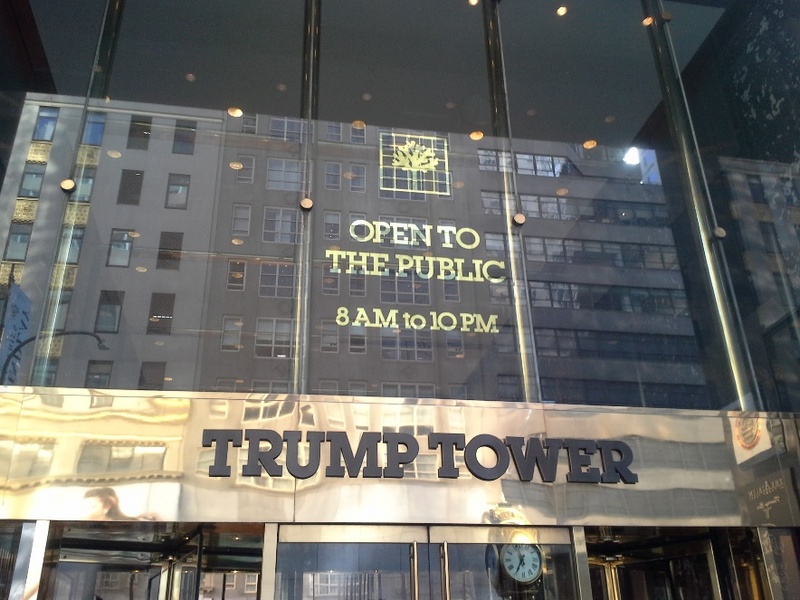 And Trump Tower does indeed offer a large space available to the public with a sign to this effect above the front door, whereas some of the worst offenders have simply closed off their POPS completely. But, on the other hand, as architecture scholar Kristine Miller notes, the “planning department file on Trump Tower is packed with memos regarding Trump’s noncompliance with his contracts” (2007: 123). And, as we’ll see, the building’s POPS violations are at times outrageous in their detail, especially considering the status of these spaces as a public good provided by the President of the United States. To understand some of the strategies of exclusion at work in Trump Tower, it is helpful to consider them in terms of the notion of “hostile design”. This refers to the design of the objects of a public space in such a way that they deter certain uses and in effect deter the presence of some targeted population. The term is used as a form of criticism, calling attention to the mistreatment of already disadvantaged groups. For example, the homeless population is a consistent target of hostile designs, which work often in conjunction with a city’s anti-homeless laws (Rosenberger 2017). Benches in parks and subway platforms are often fit with armrests or dividers in part to deter unhoused sleepers. Ledges are sometimes set with spikes to deny people a place to sit. Garbage cans are locked and fixed with “rain hoods” in part to deter trash pickers looking for food or recyclables. In this way, these kinds of objects can be understood in part as the design arm of revanchist urbanism, the spike-ledged classist and racist revenge against a city’s disenfranchised scapegoats. They are a particular set of public-space design tools used as one part of increasingly vicious urban campaigns that, as Neil Smith explained, attempt “to criminalize a whole range of ‘behavior’, individually defined, and to blame the failure of post-1968 urban policy on the populations it was supposed to assist” (1996: 222). But hostile designs can also be resisted. And this resistance comes in many forms. There are instances of direct physical contestation, such as the vandalism of the objects themselves. Art projects and activist campaigns attempt to raise awareness of hostile designs among a larger public that often otherwise fails to take notice (for examples, see Rosenberger 2017: chapter 5). Public protests and petitions sometimes challenge specific instances of hostile design, like the ones that erupted in 2015 in response to anti-homeless spikes in London (Petty 2016; Rosenberger 2014). Designers develop alternatives to hostile designs to show that public-space objects can have different politics. For example, some cities adopt trash cans fit with deposit racks that encourage people to collect recyclables, rather than deter this practice. And with regard to the specific topic of the abuse of POPS, groups have formed to keep an eye on these spaces, and to make information on them more easily available through websites and smartphone apps. Steven Flusty (1994: 16-19) has influentially categorized hostile design strategies into five types, or “flavors”, as he calls them: stealthy, slippery, jittery, crusty, and prickly space. “Stealthy” and “slippery” spaces are those that are respectively hidden or difficult to reach. “Jittery” spaces are those that deter usage through to the presence of security guards or surveillance equipment. Flusty uses the term “crusty” to refer to spaces that are somehow obstructed, such as by a gate or wall. And “prickly” spaces are those that can only be used with difficulty, such as seating areas built to be uncomfortable. The notions of stealthy, slippery, and jittery space capture some of the tone of a visit to Trump Tower. Signage reminds you that the space is monitored by cameras. Men in suits and earpiece communication devices watch the area. Of course now in the time of the Trump Presidency, armed guards walk about, and visitors’ bags may be searched or sent through a metal-detector. The existence of the upstairs public-space gardens is indicated with only minimal signage. The shrug-worthy gardens themselves are not always well-maintained. They have often over recent years featured dead trees, as well as a fountain that has been inactive every time I’ve visited. These gardens commonly do not have the required number of chairs present, which is an illegal violation of the POPS agreement. Perhaps all this is unsurprising. But it is the crusty and prickly aspects of these spaces that become callous and corrupt in the cartoonish extents to which we have grown to expect from President Trump. In tune with Flusty’s conception of crusty space, the public areas of Trump Tower are closed off whenever it is to the President’s financial advantage. For example, the atrium of building has been subject to investigation by the city for alleged closures for events held in association with Trump’s presidential campaign. According to the POPS agreement, the public spaces of Trump Tower can in fact be closed for private events a small number of times per year, but these must first come with city approval, and no requests were filed. Trump additionally went ahead and set up large kiosks in the atrium to sell campaign merchandise, such as the “Make America Great Again” hats. The city repeatedly issued warnings and then fines over this illegal use of public space for private business, and the kiosks were eventually removed once they started generating bad press (Rosenberger 2016). The “crusty” closure of public spaces is also an issue for the upper-floor gardens. 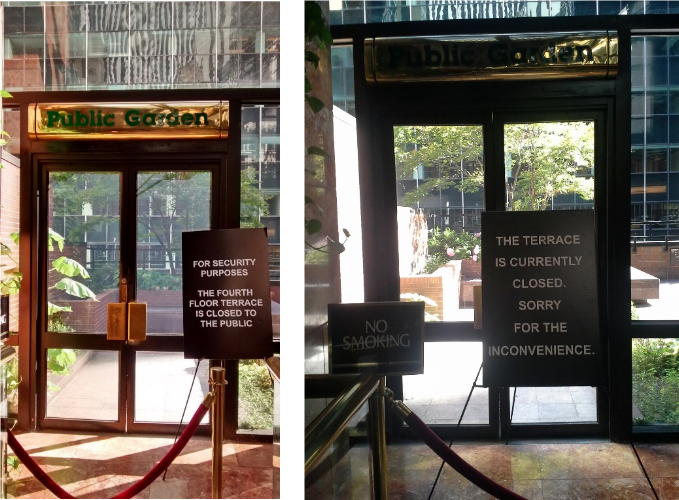 In my own visits to Trump Tower, the fourth floor garden has sometimes been cordoned off entirely. In the time since Trump was elected president, these spaces have at times been taken up by protesters, and attempts have been made by the building staff to keep them out (e.g. Babin 2017; Warerkar 2017). Both of the two upper-level gardens were closed during my most recent visits this past summer. The concierges told me they were shut down until further notice for maintenance, with no official reason, but they speculated that it might have to do with repairs related to an upper-floor fire that struck last spring (Bacon and Hayes 2018). Let’s turn next to the sidewalks in front of the building. In the early 1990s, Trump was part of a group of Fifth Avenue merchants who lobbied the city to ban disabled veteran street vendors from the area (Lee 1990). In a policy that dates back to the end of the Civil War, disabled veterans have been able to apply for special licenses to peddle in parts of the city otherwise off limits. Trump himself argued in a letter to the city that: “While disabled veterans should be given every opportunity to earn a living, is it fair to do so to the detriment of the city as a whole or its tax paying citizens and businesses?” He continued: “Do we allow Fifth Ave, one of the world’s finest and most luxurious shopping districts, to be turned into an outdoor flea market, clogging and seriously downgrading the area?” (quoted in Katz 2015). In 2004, he was at it again, arguing in a letter to then-Mayor Michael Bloomberg that: “Whether they are veterans or not, they should not be allowed to sell on this most important and prestigious shopping street…” Trump pleaded: “I hope you can stop this very deplorable situation before it is too late” (quoted in Gorta 2004). But my favorite scandal involving the prickly architecture of Trump Tower involves the case of the disappearing and reappearing bench. Since the building opened, a long marble bench sat in the atrium just across from the bank of elevator doors, the same elevator doors so often in the background of images in news articles as visitors to Trump Tower are pictured coming and going. Although it is a feature required officially by the Trump Tower POPS agreement, Trump himself appears never to have liked the bench, and methods were soon sought to skirt this legal obligation. For example, back in the 1980s the bench was lined with planters to render it unusable. The city eventually demanded they be removed. Trump futilely defended the maneuver at the time claiming that: “We have had tremendous difficulties with respect to the bench – drug addicts, vagrants, et cetera have come to the atrium in large numbers … Additionally, all sorts of ‘horrors’ had been taking place that effectively ruined the beautiful ambiance of the space which everyone loves so much” (quoted in Kayden 2017). Trump’s strategy of vilifying the “vagrants” and disabled veteran vendors for the sake of the interests of tourism and the business class is in tune with the reactionary policies NYC would develop through the 1990s. President Trump’s current lawyer and spokesperson Rudy Giuliani was New York City’s Mayor through this period and, as Neil Smith explained, he “has made no secret of the fact that his policies are explicitly designed to rid New York of homeless and other poor people” (1999: 101). Giuliani has recently summed up his own approach: “You chase ’em and you chase ’em and you chase ’em and you chase ’em, and they either get the treatment that they need or you chase ’em out of the city” (quoted in Russo 2015). 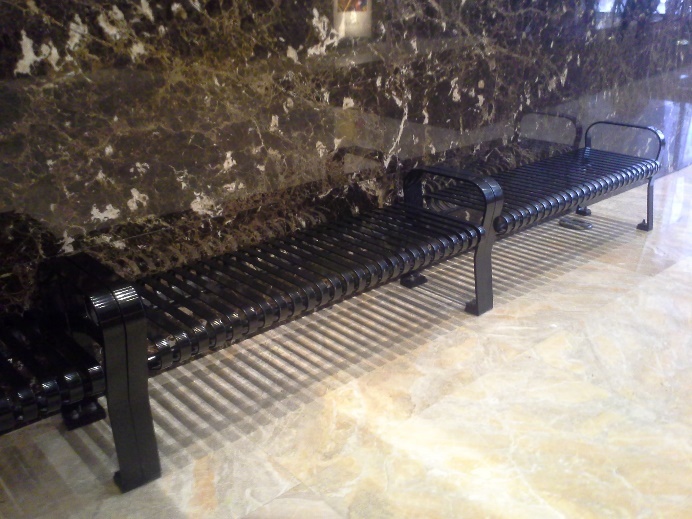 Remarkably, the Trump Tower atrium bench has continued to be a point of irritation for the building’s management. One of those illegal atrium kiosks mentioned above had been set up right in the spot where it sat. When the kiosk was removed by order of the city, the marble bench was nowhere to be found. The Trump Organization was slapped with a $10,000 fine for replacing the bench with the kiosk. Despite the fact that there was an empty spot right where the bench should be by law, representatives of the Trump Organization maintained that they had always remained in complete compliance. (My own request for comment to the Trump Organization at the time received that response from none other than Trump’s then-lawyer and “fixer” Michael Cohen.) But when it came time to defend that claim in court, Trump’s lawyers failed to show up to the hearing, chalking it up to a scheduling error. Then, suddenly, a new metal bench appeared in the atrium, after the missed hearing, but before the new court date. To their credit, the City of New York saw through the ploy and upheld the fine (Rosenberger 2016). Kayden (2017) has called the forcible return of the bench “a small win in an ongoing struggle to hold the private sector to its public commitments”. This all occurred in the lead up to the 2016 election. In her 2007 analysis of the POPS of Trump Tower, Miller has gone so far as to argue that the aesthetics of these spaces are designed cunningly (if also perhaps clumsily) to create a specific impression: Trump is wealthy from his success in private sector business, and he has benevolently invited us into his space. And she claims that this calculated impression is simultaneously designed to hide something else: “The building’s design ‘tells’ us that Trump is much richer than any of us ever will be. What it doesn’t tell us is that Trump’s fortune is founded on public money” (Miller 2007: 120). Deals like the Trump Tower POPS agreement reveal the President to be less of a private business success story, and more as someone adept at manipulating public tax funds. This observation appears only to be compounded by recent history, in which extreme and potentially fraudulent tax evasion schemes have been alleged by the New York Times to be a crucial part of the Trump family business model throughout the President’s career, and even earlier (Barstow et al. 2018). In what has now become a haunting passage, Miller reflects on an incident in the late 1980s in which Trump went to great effort in attempt to block the release of information regarding his personal finances by the New Jersey Casino Control Commission, which was looking at a debt restructuring plan Trump was pursuing at the time. This effort of course mirrors contemporary events in which President Trump has repeatedly promised to release his tax returns, and has repeatedly broken that promise (Disis 2017). Miller observes, and remember that this was written more than ten years ago, that: “It is unsurprising but perhaps ironic that Donald Trump went to such lengths to block the public release of his private financial information because – as evidenced in the Trump Tower deal – his fortune was so solidly based on public money” (2007: 136). Perhaps the cynical abuse of the Trump Tower POPS, and perhaps also an aspect of the President’s attitude toward his public obligations more generally, can be best summed up in the comment made by a Trump Organization official that there “is no agreement in existence” that would restrict Trump’s use of these public spaces “for any purpose he deems appropriate” (quoted in Barbanel 2016). Since the President’s business empire is one that centrally involves the construction and control of the built environment, the critical investigation of this empire should fall under the direct purview of the fields of radical geography and the philosophy of technology. Let Trump Tower become a paradigmatic example of the cruel manipulation of public space for the purposes of personal profit. While building on a history of work on the politics of public space, the study of hostile design is in some ways an emerging area of scholarship (e.g. Chellew 2016; Petty 2016; Rosenberger 2017; Savicic and Savic 2013; Schindler 2015; Smith and Walters 2018). The basic terminology is still very much unresolved. What I’m referring to here as hostile design is elsewhere also called “hostile architecture”, “unpleasant design”, “disciplinary architecture”, “architectural exclusion”, and “defensive architecture”. Flusty (1994), whose terminology we consider above, uses the term “interdictory space”. For analyses of anti-homeless law in the United States, see Mitchell (1997) and NLCHP (2014). Of course resistance to the wider issue of the criminalization of homelessness also comes in many forms, including the recent push for a “Homeless Bill of Rights” in many cities, which would nullify and prohibit laws that make illegal the basic necessary behaviors of people living unhoused, such as camping bans and sit/lie laws. For a resource on POPS in New York City provided by Advocates for Privately Owned Public Space and the Municipal Art Society of New York, see: https://apops.mas.org/ (last accessed 20 November 2018). For one regarding POPS in San Francisco (or Privately Owned Open Public Spaces, POPOS, as they are referred to there), see the San Francisco Bay Area Planning and Urban Research Association: https://www.spur.org/news/2011-02-03/spur-popos-guide-now-google-maps (last accessed 20 November 2018). The line that was fed to me about the missing atrium bench appears to have been the official position of Cohen and the Trump Organization in response to the minor media flap that was growing over the issue at the time, as the Wall Street Journal also printed the same statement (Barbanel 2016). Cohen has a history of making misleading comments with regard to Trump Tower POPS violations, telling the New York Times that the city had actually approved the atrium kiosks, to which the paper notes that “the repeated fines say otherwise” (Chaban 2015). This comment was made in response to the alleged illegal closures of the Trump Tower atrium for private presidential campaign events. Savicic G and Savic S (eds) (2013) Unpleasant Design. Belgrade: G.L.O.R.I.A. Robert Rosenberger is an Associate Professor in the School of Public Policy at Georgia Tech. His research in the philosophy of technology explores the habitual relationships people develop with everyday devices such as e-reading and television, with applications in design and policy. This includes lines of research into the driving impairment of smartphone usage, the educational advantages of computer-simulated frog dissection, the roles of imaging devices in scientific debates, and the critique of anti-homeless design in public spaces. His edited books include Postphenomenological Investigations: Essays on Human-Technology Relations (with Peter-Paul Verbeek; Lexington Books, 2015), and Philosophy of Science: 5 Questions (Automatic Press / VIP, 2010). A polemical mini-monograph, Callous Objects: Designs Against the Homeless, was published by the University of Minnesota Press in 2018. 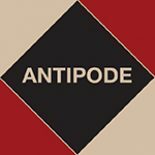 This entry was posted on 4 December 2018 by Antipode Editorial Office in Interventions and tagged activist art, anti-homeless laws, architecture, BIDs, Business Improvement Districts, criminalization, crusty space, enclosure, eviction, Fifth Avenue, gentrification, homelessness, hostile design, jittery space, Manhattan, Neil Smith, New York City, POPS, President Trump, prickly space, private property, privately-owned public spaces, privatization of public space, public space, revanchism, Rudy Giuliani, slippery space, stealthy space, Steven Flusty, street vendors, surveillance, the revanchist city, the right to the city, Trump administration, Trump Organization, Trump Tower, urban design, urban planning.